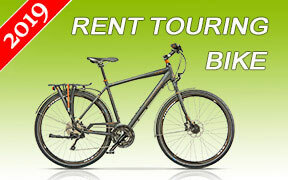 Racing bikes (road bikes) are a great rental choice to discover Europe while raising your adrenaline. Built for speed and competitive racing, everything except the speed is not essential. This class of bikes may be used on road, down hillsides, off road, through rough mountain terrain. According to this they may be divided in the following types: cycle-cross bicycles, speedway bicycles, mountain racing (off-road racing) and bicycles for velodromes (track bicycles). Racing bikes are lightweight with aerodynamic construction. In order to provide excellent performance and better efficiency, their frame must be built resembling a triangle - with three straight tubular shapes. It is made of high tech components such as carbon and weighs less than 1 kg. Regarding the efficiency, wheels and their rims must have an aerodynamic shape as well. They may be made from aluminum fusion, carbon fiber or metal. Racing bikes feature narrow, light tires with thin tread in order to lessen air and rolling resistance. Racing bikes manufacturer are Shimano, Campagnolo, SRAM etc. and some of the best racing examples are Litespeed L1 Dura Ace, Focus Cayo Evo 4.0, Scott CR1 Team, Road bike, Focus Izalco Pro 3.0, Litespeed Li2 Di2, Orbea Orca SLi2, Orbea Orca GLT and BH Cristal Dura Ace di2.